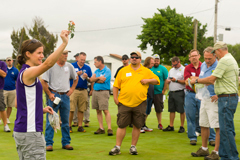 The Kansas Turfgrass Field Day program, sponsored by K-State Research and Extension, will take place Aug. 4 at the Rocky Ford Turf Research Center, 1700 Barnes Road, in Manhattan. The program is designed for all segments of the turfgrass industry — lawn care, athletic fields, golf courses and grounds maintenance. Included on the program are research presentations, problem diagnosis, commercial exhibits and equipment displays. See current research, talk to the experts, and get the answers to your questions. Find more information on the event's PDF flyer.